It all began with our unique Estate Pinot Gris, inspired by the opulent style of Alsace, France, and first launched by Murray McPhail and Nick Nobilo in 2007. Steve Voysey then joined Ashwood in 2010 to produce the first Estate Chardonnay, which went on to win the Champion Chardonnay Trophy at the New Zealand International Wine Show. Steve has now taken over the winemaking for the brand, and the wines are steadily gaining recognition. A particularly special 'Late Harvest Pinot Gris' was made in 2013, because the near perfect vintage demanded a wine of this style be made to mark it. From the same vintage, the ‘Ashwood Classics’ range was launched as an introduction to the Estate range, and to showcase the classic style of Gisborne, for each varietal. Most recently, we are excited to have released our first Blanc de Blancs. This light, sparkling wine is picked, pressed and made in the manner of French Champagne, whilst remaining true to Ashwood, and to the Gisborne terroir. These single-vineyard wines are made from low yielding, hand harvested grapes, using the best of traditional wine making techniques. 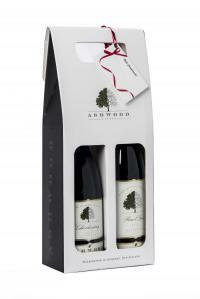 Reward that special person on your list with one of our beautifully presented giftpacks. Available for delivery anywhere in New Zealand.